Mother's Day is just around the corner and what will you be doing this year to show her how much you care? If you're planning to bring her on a road trip, a dash cam for that extra protection on the road is definitely a must nowadays. 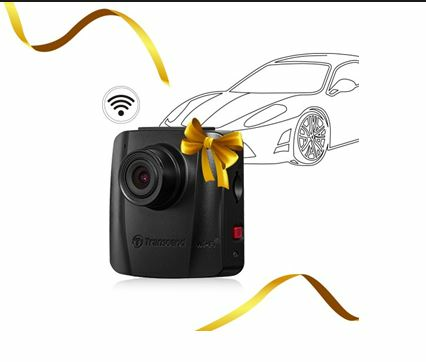 Transcend Information, Inc. (Transcend), a leading manufacturer of storage and multimedia products, is proud to offer its 2017 Taiwan Excellence Award winning product, the DrivePro 50, to provide the ultimate protection on the road for you to enjoy a worry-free road trip with her. The Transcend DrivePro 50 features a large F/1.8 aperture to capture all details of an incident, including license plates, during either daytime or nighttime. The camera also integrates a wide 130° viewing angle and a Full HD imaging sensor for clear and smooth 1080p (30fps) video recording. The DrivePro 50 features a compact design, measuring just 55mm × 58mm x 31.15mm and weighing only 49g. It can be well hidden behind the rearview mirror without blocking the driver’s view while getting its job done. As the traffic on the road has gotten pretty intense over the years and the rising numbers of insurance scammers, a dash cam has been one of the essential gadget that every drivers need to protect themselves from such incidents. The DrivePro 50 features a built-in G-Sensor that triggers the Emergency Recording mode instantaneously when an impact is detected during normal recording which prevents the recorded video footage in emergency mode from being overwritten. Its red emergency button located on the side of the DrivePro 50 allows user to manually enable the Emergency Recording mode which can be very useful for evidence collection in case of a fraudulent claim or lawsuit. Thanks to its built-in Wi-Fi and Transcend's exclusive DrivePro New App, the DrivePro 50 can be operated entirely via iOS or Android devices. When connected to the DrivePro 50's dedicated wireless network, users can stream, playback, and download videos, and easily adjust DrivePro 50’s settings directly from their smartphone or tablet. The DrivePro Toolbox features a user-friendly interface that allows users to easily sort video files by its file name, date, or group for the ease of file management. It also allows Windows and Mac OS users to select and playback the recorded videos on the DrivePro 50 without the needing to install separate codecs. The DrivePro 50 is bundled with a very user-friendly mounting kit and a Transcend High Endurance 16GB microSDHC MLC memory card that offers consistent performance and durability. In case if you wonder, the DrivePro 50 has a Loop Recording mode enabled by default. The older footage in the memory card will be overwritten by a new one when memory card capacity is full, so that you can save unnecessary spending on an extra memory card. The Transcend DrivePro 50 is backed by Transcend's Two-year Limited Warranty.